Scientists have discovered a molecule that plays a key role in the development of sperm. The Cancer Research UK team were actually investigating the role of JAM-C in the formation of new blood vessels around tumours. Their work suggests genetic defects interfering with the normal function of the molecule could cause infertility by blocking the maturation of sperm cells. Our results suggest that the molecule is key in determining which end becomes the head and which the tail in sperm cells. 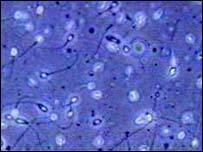 Sperm cells develop in the testes and undergo a series of changes until they are mature and viable. They begin life as round cells and as they mature they elongate and develop a tail. Defects at any stage of this process can prevent the cells from maturing and lead to male infertility. The team knocked out the function of the gene that controls production of JAM-C in mice. They found that the male mice unable to produce JAM-C were infertile and had round instead of elongated sperm cells. Lead researcher Dr Ralf Adams said: "Very little is actually known about the biological role of JAM-C. Recent studies have suggested that the molecule may be important in the formation of new blood vessels around tumours. "We wanted to find out what the normal function of JAM-C was, so we looked at what happens when the gene that codes for the molecule is disrupted. "It was somewhat of a surprise to find that male fertility was impaired." The team looked at whether the levels of JAM-C change as sperm cells mature. They noticed that the molecule was widely distributed in round sperm cells but could be found at a particularly high level on one side of the cell. As the cells matured JAM-C was only found in the heads of elongated sperm. The findings led the team to believe that JAM-C might have a role in defining which end of the sperm cell becomes the head. To explore this further they studied the cellular distribution of molecules known to regulate the process. They found that these molecules were distributed in the same areas as JAM-C during sperm development. Dr Adams said: "We found that JAM-C is essential for sperm cells to mature in mice. Our results suggest that the molecule is key in determining which end becomes the head and which the tail in sperm cells." To see if JAM-C played a similar role in human sperm, they studied its distribution in human testes. They found a pattern that was strikingly similar to the one found in mice. Dr Adams said: "We discovered JAM-C had a similar pattern of expression in human sperm to that found in mice. This suggests that defects in JAM-C could contribute to male infertility in humans. It will be important for scientists working in this area to investigate this further." Dr Lesley Walker, director of cancer information at Cancer Research UK, said: "Some of the biggest discoveries in science have arisen unexpectedly. "Biological systems are complex and interrelated. Research into the molecular mechanisms behind cancer can occasionally open up exciting new leads in a different area. "This new finding will provide important information for those trying to understand the molecular basis of male infertility." Previous research suggests that JAM proteins help assemble structures called "tight junctions" in the body. Tight junctions seal the cells that line our blood vessels together.